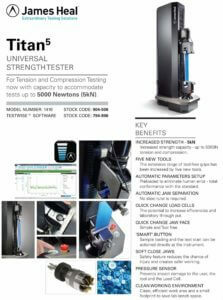 Titan Universal Strength Tester James Heal now in Bangladesh for Tension and Compression Testing now with the capacity to accommodate tets up to 5000 Newtons. The extensive range of tool-free grips has been increased by five new tools. Automatic parameter setup. Preloaded to eliminate human error- total conformance with the standard. Quick change load cells. 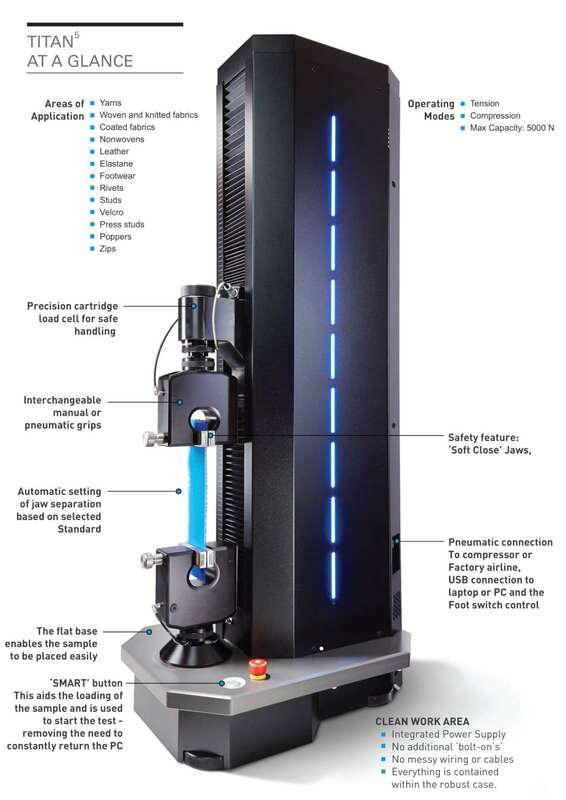 The potential to increase efficiencies and laboratory throughput. Quick change Jaw face. simple and tool-free. Smart Button| sample loading and the test start can be actioned directly at the instrument. Pressure Sensor: Prevents impact damage to the user, the tool and the Load Cell. Clean Working Environment: Clean, efficient work area and a small footprint to save lab bench space.